This is the reissued Colour Oxford Dictionary and Thesaurus. 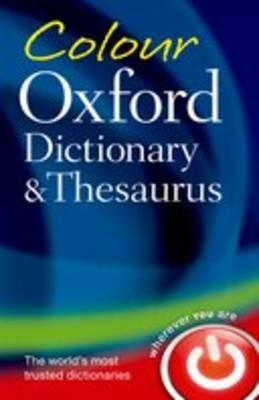 The Colour Oxford Dictionary and Thesaurus offers the most accurate and up-to-date coverage of essential, everyday vocabulary, with over 45,000 words, phrases, and definitions, and over 65,000 synonyms based on evidence from the Oxford English Corpus, a unique databank comprising hundreds of millions of words of English. Definitions are easy to understand, given in a clear, simple style, and avoiding technical language. The thesaurus entry for a word sits directly alongside the dictionary entry so that you do not have to hunt around the page to find the word you are looking for. The centre section gives guidance on 'Effective English' which covers writing English and how to get the best out of your dictionary and thesaurus. Includes 6 months' access* to Oxford Dictionaries Online at oxforddictionaries.com. *Terms and conditions apply; please see www.oxforddictionaries.com/access for information.